Are any of you parents as exhausted as I am? September has just been non-stop, and I was so exhausted on Friday that I actually fell asleep on the couch at 7:45 (I’m such a party girl). I just couldn’t keep my eyes open any longer. I did force myself to wake up from my little catnap at 8:30, as I knew if I stayed asleep that I would be up at 1:00 in the morning. I also had to stay awake as Zoe was out at a birthday party, and didn’t get home till 11:00 (gasp). John and I had our first glimpse of what it’s going to be like waiting up for a teenager and I’m not sure I’m ready for it yet. I’m such an early to bed kind of gal (not 7:45 early) and don’t know if I’m going to be able to stay up and wait for the kids to come home. Any parents of teens out there have some tips? Do I start drinking coffee in the evenings? I know wine is not the answer, as it puts me to sleep. I guess I still have a few years to practice, right? Please let the years go slowly, as I’m in no rush for the kids to grow up. You’re probably wondering what those strange looking things are in the above photo. Those are the sugar crusted popovers that I baked for the kids yesterday morning. I got up early to get the eggs to room temp, (pretty easy to get up early when you go to bed at 7:45) but it was well worth it, as the kids were super psyched when they got up and smelled these puppies in the oven. They have been begging me to make them for months, so I finally sucked it up and made them. Let me just tell you that I did not hear a peep from them while they were eating these, it was so silent that you could literally hear a pin drop. Make these for your kids, I promise you they will LOVE them. 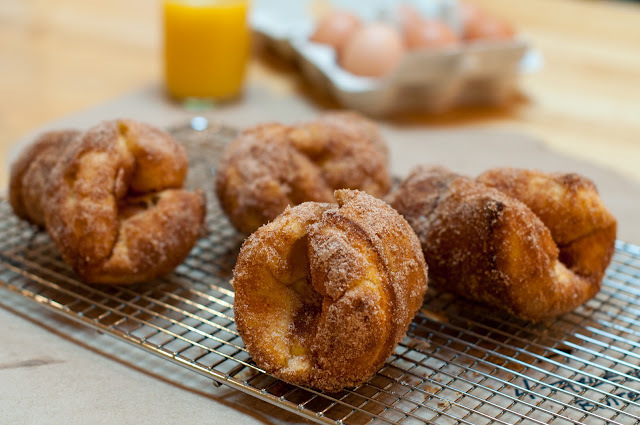 They taste like donuts, but are better and way easier. 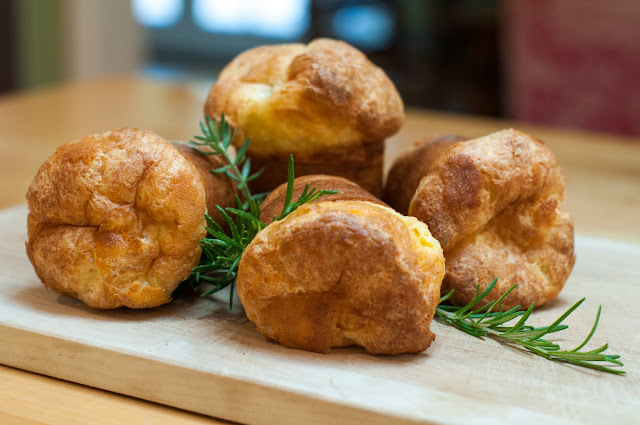 You don’t even need a popover pan, you can use a standard muffin pan. I have a few things on this week’s menu that I haven’t posted yet, but I promise I will post them soon. It’s officially fall, so you will most likely see some sort of soup in our weekly dinner menu. Soups are the perfect weekday meal because you can make them ahead of time and use them that week or freeze them for later. I’m making tons of the Heirloom soup now, as I want to freeze batches for the winter. 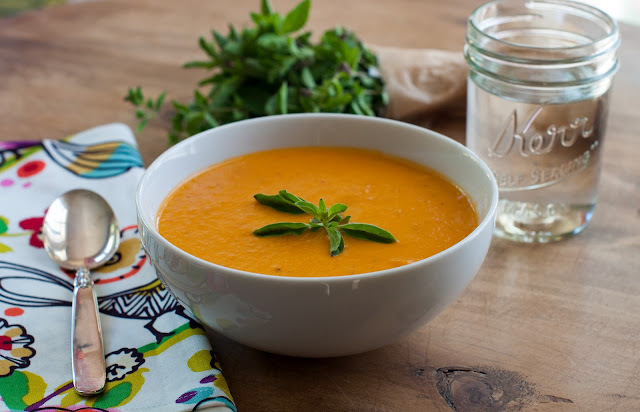 Another one of my favorite fall soups is my roasted red pepper and tomato soup. Red peppers are all over the place now, so it’s the perfect time to enjoy them. Monday: heirloom tomato soup and grilled cheese sandwiches. 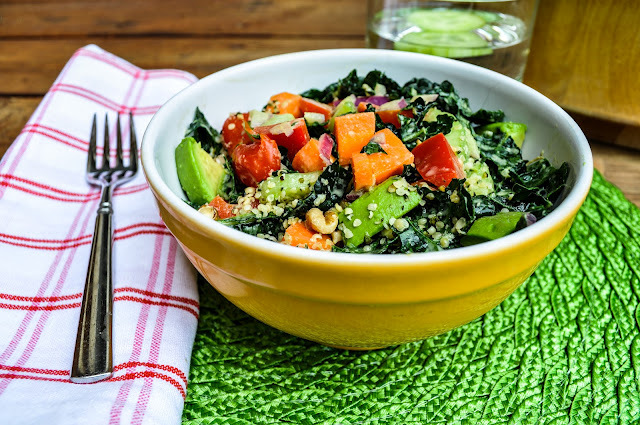 Tuesday: New recipe! 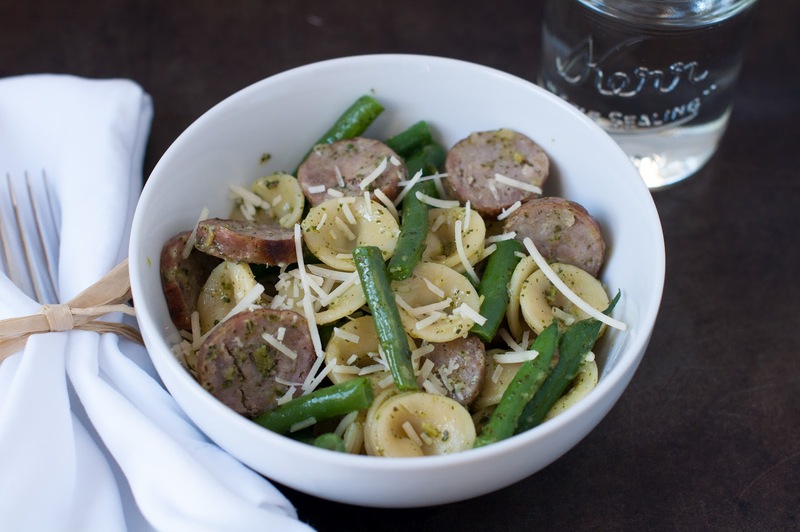 Pesto orecchiette with sausage and green beans. 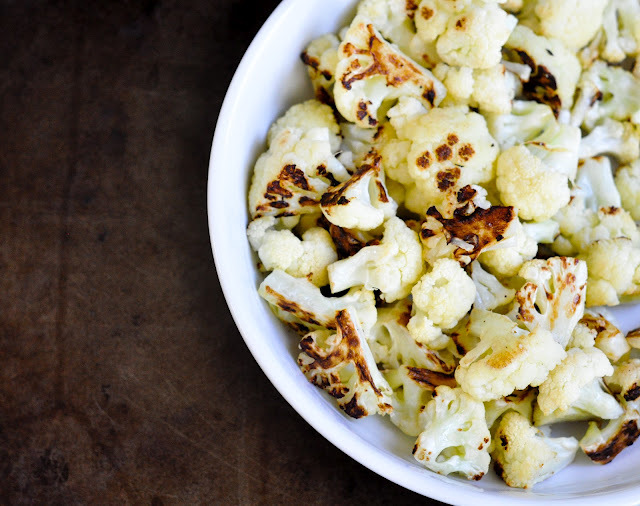 Look for the recipe this week! Wednesday: Chicken with shallots, popovers and roasted cauliflower. My kids have been begging for this meal, as it has 3 of their favorite things. This is a kid approved (10+) and favorite meal among friends as well. I make this meal a lot when I have the kid’s friends over. Thursday: Crazy Thursday! Take out night! Friday: Deep-dish pepperoni pizza (photo and recipe soon) & kale salad with tahini & lemon dressing. I hope you all have a restful and blissful Sunday. Stay tuned this week for the orecchiette with sausage recipe. 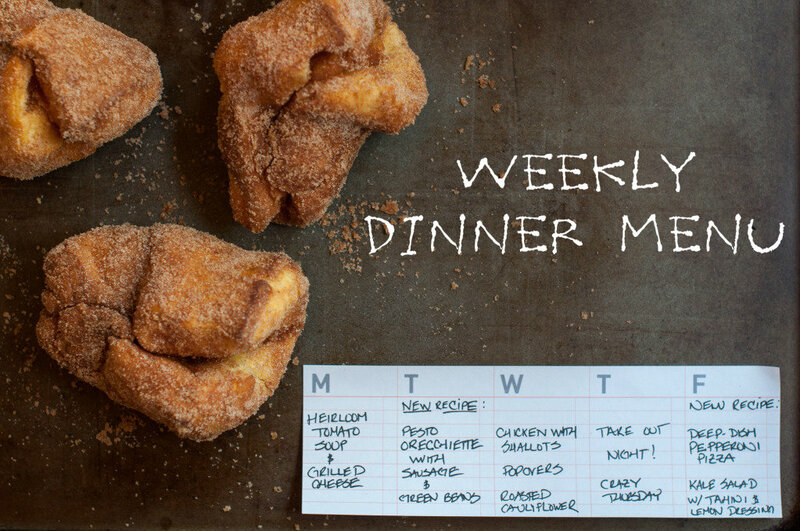 It’s a kid approved and easy weeknight meal. Hi Marin mama! I made the chicken with shallots, popovers and cauliflower last night for my family and let me just say it was a winner dinner. Thank you for such a great recipe. I can’t wait to try the pasta. Thanks Sara! So glad you made everything and that the family approved. Its not the prettiest looking dinner as far as color appeal but it definitely has taste appeal. Those popovers look amazing. I’m definitely going to make them for my kids this weekend. I just love your blog and I love seeing your weekly menu as it helps me figure out what to cook! Thanks so much for the sweet words Katlin! I’m glad the menu helps you. It takes me a while to coordinate it, but it is worth it when you don’t have to figure out dinner each night. you think i am kidding or just saying this but I am so making that chicken and shallot dish this week and those popovers. sounds to amazing not to try! Thanks girl! You’re going to be so happy when you do, just saying… It’s the perfect comfort dinner.